Network Rail and ScotRail have confirmed a £12m joint investment that will deliver a more modern and comfortable train service for customers between Glasgow Central and Paisley Canal by December 2012. The work to electrify the 8-km stretch of line will be the first major project to be delivered under a landmark new ‘alliance’ in practice a closer, more efficient working relationship between the two rail organisations. Following the electrification publicity shots, with sleek Class 380s, the Paisley Canal branch seems to have settled down to operation with the more mundane (but perhaps more suitable) inner suburban Class 314 units. 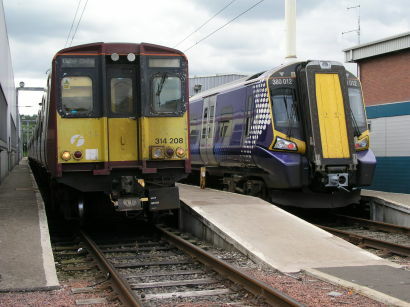 314216 pauses briefly at the terminus before returning to Glasgow. 380004 preparing to leave Paisley Canal with the 14.30 to Glasgow Central on 19 November 2012, the first day of electric operations over the branch. Electrification notice at Paisley Canal terminus on 7 November 2012.